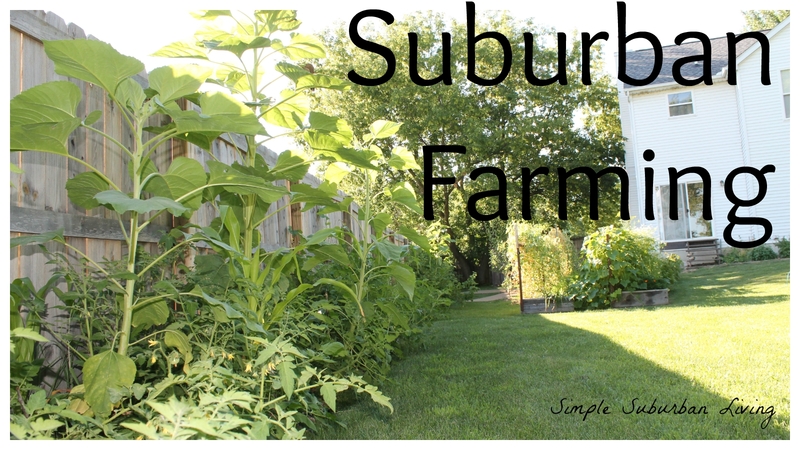 Live in a small lot in the city or suburbs? Did you know that you can still produce a decent amount of food for yourself? Here in the U.S about 80% of us call the city or the suburbs our home but why can't we produce some of our own food too! In this video I give a quick tour of some of the ways in which we are utilizing space around our yard to grow food. It is a work in progress but much progress has been made in the last 18 months since we started this venture. The goal for us is to produce as much of our own food as possible for now and eventually produce all of our own vegetables and fruit for the year. We started with the chickens last year and some small garden spaces. The chickens have been the highest producers and most impactful addition to our small homestead. We feed them our food scraps and they graze in our yard; in return they produce six eggs per day for our family. That is a lot of eggs! Chickens are probably the only real livestock that we will be able to have here on our small lot and they are a perfect fit here. The first gardening step we took was to watch the amount of sun that we get in various areas of the yard. Unfortunately the best area for gardening at our home is also the septic tile field and cannot be used. We decided to start with raised bed gardens. Closer to the house in a hilly location where traditional gardening would not work well. We current are using 6 3'X6' raised bed garden boxed made for free from pallets. These have been able to produce many pounds of sugar snap peas, over 180 carrots, 72 onions, over 15-20 cucumbers per week, basil, lettuce, dill, spinach, cilantro, and a potato harvest coming soon. You can pack a lot of food into a few square feet with the square foot gardening method. Along our privacy fence we have about 96' of space that was not being used. This does not get full sun all day but it gets plenty for more than half. A garden bed was cleared along the fence about 36" wide and amended with compost, peat, and some sand. We then layered planting here so that we have some climbing or taller plants in the back along the fence, some tomatoes a along, vining plants along the front bottom edge and some corn plants scattered along the front edge in between the tomatoes. This is proving to be a very dense and efficient way to plant along this area and will produce a huge amount of food for us this year. In the back of the property we sectioned off a small 20' X 20' area and planted six apple trees. We covered the ground with free mulch from the city park and we now have an orchard in the makings. As these tress grow and produce more and more each year we will eventually be able to make apple cider, apple cider vinegar, pies, canned apples, and dried apple fruit snacks for long terms storage. We have also landscaped up near our house and instead of flowers and bushes have planted an herb and strawberry garden. This will be a perennial garden and will continue to become more diverse each year. We also utilize space between other landscaped areas for tomatoes, cabbage, peas, beans, sunflowers, and flowers to attract pollinators. Even though these are smaller scattered spaces they have proven to be very productive. Each year the gardens grows, a few more fruit trees are planted, a few more raised beds are built, and more land is cleared from grassy nothingness to food producing farmland. Although we are not buying a combine yet, the small suburban farm is an ever expanding adventure that we will never be finished with. Thanks for tagging along to see how the SSL Family grows in the suburbs. Thanks for the inspiration. We have a small lot, and I'm always trying to find new ideas on how to use the space. Next I'm going to try some shade growing vegetables. What type of cucumbers did you grow in this garden? Just a suggestion I have been trellising my indeterminate tomatoes with great success. Trellis I use is similar to livestock fencing on the ends of my garden beds. In one bed I have planted artichokes, tomatoes chives and strawberries that hang over the edge of 4 x10 bed. I use beer traps for slugs and bird netting to keep my harvest of berries away from bunnies, deer& birds. Keep up the good work.